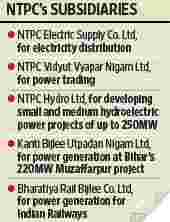 New Delhi: NTPC Ltd is planning a restructuring exercise that requires the state-owned power generator to review the future of its numerous joint ventures and subsidiaries. The move has been prompted by the utility’s desire to ensure that its management bandwidth and resources aren’t stretched too thin. “The idea is to see whether these joint ventures and subsidiaries need to be restructured, closed, or reoriented," said a person familiar with the development, who spoke on condition of anonymity. “The plan is to rationalize or exit (ventures in) areas that don’t make sense," added a senior NTPC executive, who too did not want to be identified. NTPC chairman and managing director Arup Roy Choudhury confirmed that a restructuring was on, but denied that this would lead to exits from some ventures. “No such issue," he said in a text message. “Any good company should keep reinventing itself to become a ‘great’ company." The restructuring exercise comes at a time when NTPC has already expressed its desire to exit International Coal Ventures Pvt. Ltd (ICVL), a company promoted to buy coal mines overseas. NTPC has 18 joint ventures and five subsidiaries in areas such as electricity distribution, services, energy efficiency, equipment manufacturing, power trading, power exchange and coal mining. In addition, the company has announced plans to form a joint venture with the Asian Development Bank and Kyuden International Corp. The environment in which the country’s largest power utility operates has become more competitive with the introduction, this year, of a tariff-based competitive bidding process for NTPC. Previously, NTPC has been building plants on a cost-plus basis, which means it gets to charge a price that factors in the cost and a certain return. India has a power generation capacity of 181,000 megawatts (MW) and expects to add 62,374MW by 2012. In the 12th Plan period (2012-17), India plans to add 100,000MW with NTPC expected to play an important role towards meeting the power demands of the country. NTPC, which has a share of around 20% in India’s power generation capacity, is looking to increase its capacity from 34,854MW now to 75,000MW by 2017 and 128,000MW by 2032. It has projects totalling 14,088MW under construction.